Alphée has a rare genetic disorder that hampers her development. Yet she continues to defy medical expectations. When her parents intuitively reject the idea of placing her in a specialized classroom, they move their family to Europe for a year. Here, her father – filmmaker Hugo Latulippe – focuses on his fairy-like daughter's learning, in hopes of eventually integrating her into a regular classroom. This film is a moving declaration of love from a father to his daughter. It is also the story of a gamble: stealing away for a year in order to try and change the course of events. An intimate and revealing portrait, Alphée of the Stars puts the spotlight on a most unusual girl. With patience and tenderness, Latulippe – who believes in schools that embrace the diversity of humanity and do not discriminate – challenges our assumptions and reveals an unknown world that may have escaped us in our daily rush. In a check-box society that functions by dividing us into neatly-defined categories, where does someone with a strong mind and a weak body fit in? Dr. Heidi Janz - award-winning playwright, accomplished academic, and self-described ‘crip’ – has a curious problem. Despite her obvious physical limitations she is denied financial assistance from government programmes because of her “productive” mind. Following Heidi through her everyday life, with all its unique responsibilities, opportunities, and challenges, We Regret to Inform You... offers an unsentimental, and unapologetic, look at what it means to be both “disabled” and “productive”. Art, activism and disability are the starting point for what unfolds as a funny and intimate portrait of 5 individuals. Director Bonnie Sherr Klein (Not a Love Story and Speaking Our Peace) has been a pioneer of women’s cinema. SHAMELESS: The ART of Disability marks Klein's return to a career interrupted by a catastrophic stroke in 1987. She turns the lens on the world of disability culture and the transformative power of art. Joining Klein are a group of artists with diverse (dis)abilities. Humorist David Roche is taking his one-man show, The Church of 80% Sincerity, to New York’s off-Broadway. Poet Catherine Frazee is navigating a jam-packed schedule of teaching and speaking engagements. Dancer and choreographer Geoff McMurchy is organizing KickstART, an international festival of disability art. Sculptor and writer Persimmon Blackbridge is creating mixed media portraits from “meaningful junk”. Klein gathers these artists for a pyjama party where they take a subversive look at Hollywood stereotypes of people with disabilities: The Monster, The Saint, The Psycho, the Poor Little Crippled Girl, etc. The artists decide to turn the tables, making a pact to meet a year later at the KicksART Festival with the intent of creating their own images of disability. The film tracks this motley gang of five while they create and then present their self-representations. 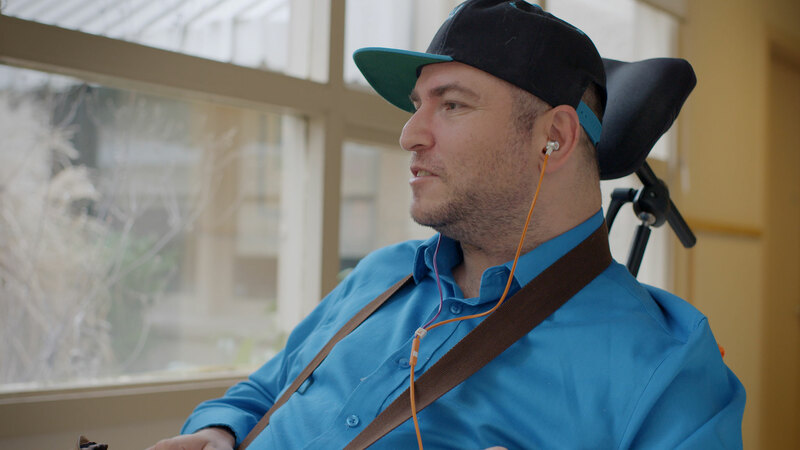 As we get to know each of these remarkable people driven by a passion for art and transformation, the everyday complexities and unexpected richness of life with a disability are exposed.